Singer/Rapper/Actress, Mulan V commands attention when she walks into any room. Statuesque at 5’9”, she is the founder of www.MulanVBeauty.comparlaying her love for performing and knack for beauty into a successful career. Born Marshaye Nicole Miller in Los Angeles, California, Mulan V knew she was destined for stardom by the age of 5. She graduated from the prestigious Robert F. Kennedy Community Schools - Los Angeles High School Of The Arts. One of her teachers there commented, “She has a natural disposition for performing…her love for singing and acting oozes out of every pore.” Recently signed to Freestyle Records Inc. Mulan V couldn’t be happier to launch the next phase of her career. 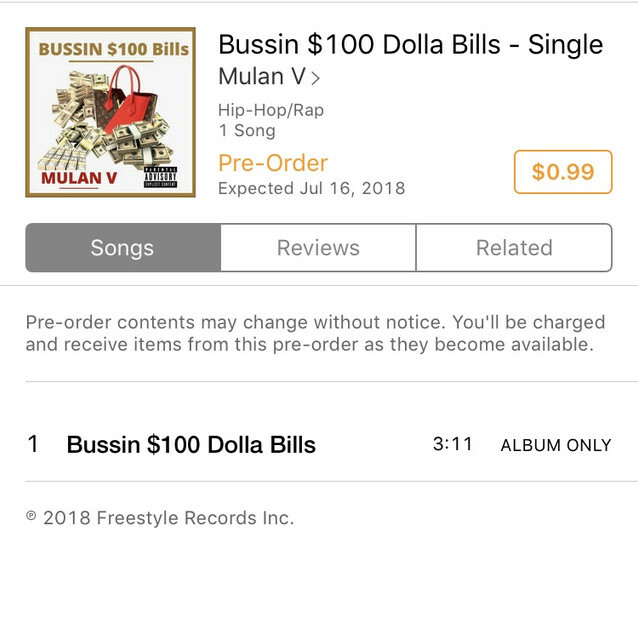 Label President, Big Marv says, “A star was truly born, and she’s definitely a chosen one.” Mulan V is excited about the music industry and her place in it. “I am convinced that I am destined to entertain and it is a part of my being. Performing on a stage is like being at home in my comfortable space, it’s fulfilling and natural.” Mulan V is thrilled to announce her newest single “Run That Back" is being released on Freestyle Records Inc/SMC-Entertainment-INgroove/Fontana this Summer 2016. Her debut single "Shut It Down" was release in 2013.